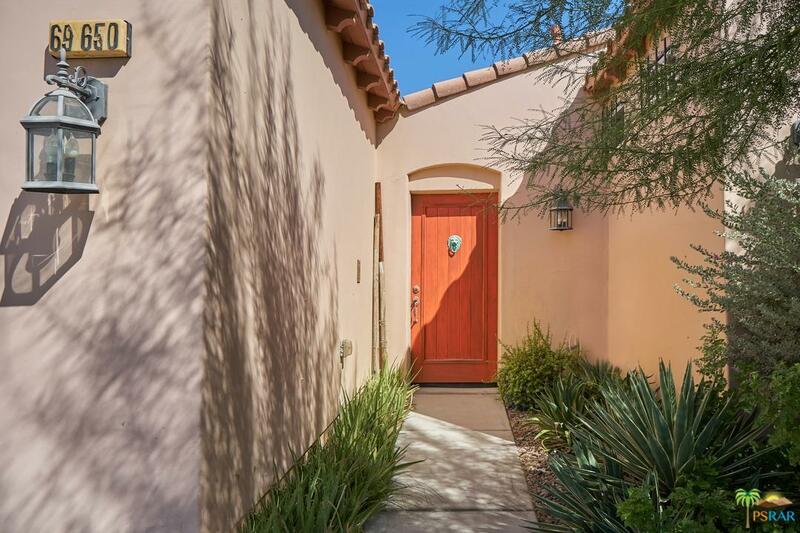 Think quaint, quiet, private Mexican/Tuscan getaway. A compound in which the outside world disappears once inside. The private courtyard is bathed in light and color. Chill in the large lagoon like pool - you're relaxed & content. Inside this supremely designed home you'll find an inviting great room with high ceilings warmed by a stack stone faced fireplace for those cool Desert winter nights. The kitchen, featuring a 15' long island is perfect for serving hor d'oeuvres to your guests at dinner parties. Stainless steel appliances, Granite Slab counters all thoughtfully laid out - form the kitchen. Steps away, off the kitchen is a large slider taking you to a patio featuring a BBQ. At night, you'll choose from two Master En-suites Bedrooms, well separated for privacy and serene sleeping. One master bath has a tub/shower and dual vanities and the other with an oversized shower. Outdoors you're protected by a custom covered portico. Welcome to Rio del Sol and to the best of a community!